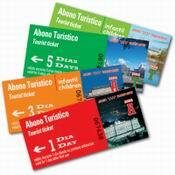 The Travel Pass is a wonderful way to save money when using Madrid's public transport systems, and is the perfect compliment to the Madrid Tourist Card. This transport ticket is valid for all of Madrid's Metro and Bus services within the city, together with the local suburban trains and the inner-city light railway. The surcharge normally added to the price of a Metro ticket from the airport is also included. The pass is available for 1, 2, 3, 5 or 7 days, and can be purchased for Zones A or T. Most of our visitors will require a pass for Zone A only, which covers all locations within Madrid's city centre including the airport. It is unlikely that you require Zone T tickets, unless you need transport to villages and towns within Madrid's autonomous region but outside the city of Madrid itself. Taking into account that the price of a single Metro ticket is 1 euro and that the Metro to or from the airport costs 2 euros, the Madrid Travel Pass is an excellent opportunity to save money if you intend to use Madrid's public transport services during your stay. The ticket is delivered in a protective plastic holder and includes Metro, bus and train maps, together with landmarks and places of interest in Madrid. Instructions for use are also included. The pass must be purchased for the number of days you will use it for. It will then be activated the first time it is used, and the expiry date printed on the back. The pass is then valid until 5am on the day after the expiry date, allowing you to use the late nocturnal transport services as well. Note: Children under 11 pay half price. Prices include tax. The Travel Pass may be purchased online by clicking the blue button above. You will be sent a receipt by email, which can then be exchanged for the ticket itself, at the Madrid Metro Customer Service Desk ("Centro de Atención al Cliente", open every day from 7am to 10pm) just outside the Metro Station in Madrid Airport's Terminal 2, or at the tourist office in Plaza Mayor.